Polygon Shank Cone Drawbars and Grippers - OTT-JAKOB PSC | Advanced Machine & Engineering Co. The polygon shank cone is a powerful interface that has proven its effectiveness especially in multitask machines. Launched on the market in 1990 under the name Coromant CAPTOTM, it was internationally standardised under ISO 26623 after the patent expired. The main feature of the polygon shank cone is its unique tapered polygonal shape which, due to its self-centring properties, effectively prevents axial and radial play. The face contact accurately defines the position of the tool in the holder and produces high repeat accuracy. The PSC interface features very high stiffness due to the large taper diameter. Additionally, the balanced distribution of torque over the polygon surface generates maximum stability. The OTT-JAKOB PSC clamping unit was designed based on the existing components of the OTT-JAKOB clamping system, allowing it to integrate seamlessly into our modular system. This makes it possible to equip spindles with HSK or PSC. OTT-JAKOB provides a complete mounting group consisting of clamping unit and spindle sleeve, including a connection for cleaning air and media supply. The internal contour in the spindle sleeve means it is no longer necessary to produce the PSC contour. The gripper segments are coated with high-quality DLC, which has proven to be excellent protection against wear in OTT-JAKOB HSK-Clamping-Units and ensures a long life span. 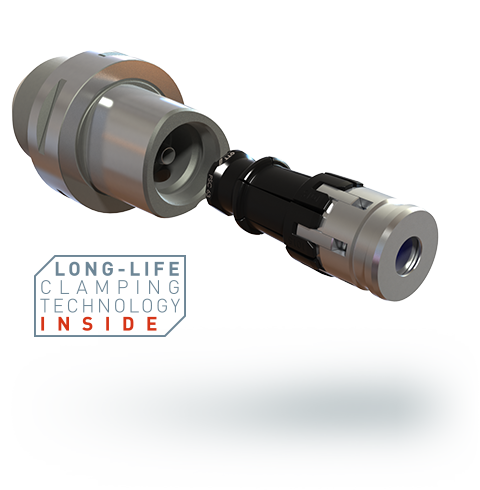 Its design makes the clamping unit for polygonal tapers compatible with a central coolant supply.